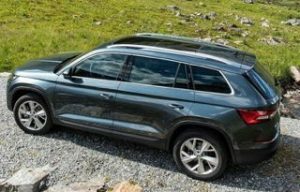 The Skoda Kodiaq is a five or seven seat mid sized SUV that shares the VW MQB platform with the smaller Volkswagen Tiguan and Seat Ateca. The Kodiaq is 19.3cm longer, 4.3cm wider and 3.3cm taller than a Tiquan but the extra 11cm between the front and back wheels (wheelbase) means Skoda can squeeze in two extra seats, albeit only designed for carrying children. The second row however offers plenty of room, and because the seats sit on runners (60:40 split rather than the 40:20:40 of some rivals) it is possible to juggle leg room between passengers, please note only the two outside seats have Isofix points so three (modern) car seats is a no. 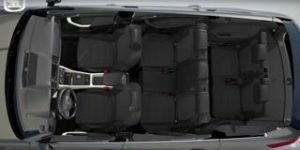 Boot space is a reasonable 270 litres even with all seven seats in place, comparable to that found in a Ford Fiesta, drop the two rear seats and the space increases to 630 litres or if you opted for the 5 seat only car 720 litres, by comparison the Nissan X-Trail offers 550 litres of storage. Considering its size, the Skoda Kodiaq is enjoyable to drive. Its steering is accurate and well controlled when cornering, yet not at the expense of comfort, as the Kodiaq’s suspension copes well with bumps. It’s not quite as smooth-riding as the Peugeot 5008, but it’s sharper as a result and the suspension also works better than the Nissan X-Trail’s. The Kodiaq has been picking up awards since its launch in early 2017, Whatcar, TopGear and AutoExpress all awarding it best in class. To Mobility customers the Kodiaq comes in three trims ‘S’, ‘SE’ and ‘SE-L’, the entry level car is well equipped with a 6.5 inch infotainment screen that is compatible with your smartphone (Carplay and Android Auto), DAB radio, automatic emergency braking, air conditioning, keyless entry and 17-inch alloy wheels. Moving up the SE brings 18 inch alloy wheels, headlight washers, 8 inch touchscreen infotainment system, cruise control, four extra speakers, climate control, rear-parking sensors, auto lights and wipers and tinted rear windows. The SE-L has the delightful 9.2 inch ‘Columbus’ touchscreen with built in Sat Nav, 19 inch alloy wheels, LED headlights, Alcantara upholstery, heated front seats, foldable door mirrors and a powered tailgate. Unless you are a low mileage user a diesel engine is better suited to a large car intended for carrying people and luggage, the 2.0 litre 148 bhp unit is a perfect match, 60mph in 9.9 seconds, available as a front wheel drive or all wheel drive automatic or manual, even as a 4×4 auto the claimed economy is 49.6 miles per gallon. The Diesel Kodiaq is an excellent tow car (2018 Caravan and Motorhome Club Towcar of the Year) as an all wheel drive Automatic the max towing weight increases from 2000kg to 2300kg. 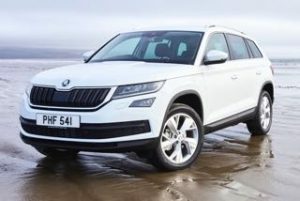 The front wheel drive only 1.5 litre petrol offers 148 bhp and a claimed economy of 44.2 miles per gallon and is perfect for those who cover lower mileage with prices stating at £1995 and is the only way to have your Kodiaq in SE-L trim. The Mitsubishi Outlander offers seven seats, a petrol engine and better value this quarter.